With customer satisfaction our #1 priority, we allow you to custom build your own package from our menu of services. The most common upgrades from our basic DJ and MC teams, are lighting and video production. Increase the energy and vibe on your dancefloor! We work with some of the most talented musicians in the business. For a percussive taste, the talented percussionist we hire won't disappoint! Horns or strings? Our saxophonist and violinist play wirelessly and walk through your crowd enhancing the DJ's mix! Our state of the art lighting and video systems, allow us to position light units and video screens anywhere in your event space. This allows for creative design ideas, utilizing your space to the fullest extent. 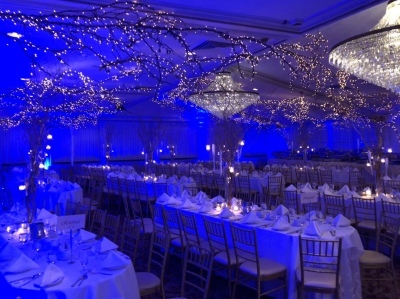 Impress your guests with custom staging and your names, or a monogram in light! Wirelessly uplight your centerpieces or the perimeter of your event space as well! Our CO2 guns cool down your dancefloor and take the energy to the next level! Check out the video clip and add a fresh element to your event. We also offer Photobooths, Indoor Sparklers, LED Robots, Confetti Blasts, Decor, and so much more!